In a previous post I wrote about a great out-of-the box customer experience I had with an Olympus E-510 SLR digital camera. Of course for every great experience there is likely to be one not so great. I think you know what’s coming. 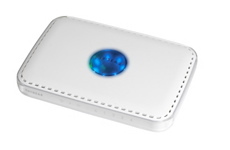 Very recently I opened up a new wireless router, the Netgear RangeMax WPN824, all eager and ready to install it. Here’s what happened. One day a few weeks ago, none of my 5 computers or Sonos boxes could access the Internet. OH MY GOD! WE CAN’T GET ONLINE! My oldest son felt violated. Apparantly losing Internet access is comparable to having a plague on your house. This is red alert time, so I sprung into action. After all we do EVERYTHING online, even order groceries, so that means no food. I checked all the cable connections and rebooted the modem and router, and still nothing, despite all lights flashing green. A call to Comcast told me that my connection was live and strong, and my modem was working, so it must mean a dead router. My first router was also a Netgear (RP614) purchased back in 2000, when you could only get hardwired models. It cost me $50 about 8 years ago, so it seemed fair enough to me that I would need to replace it. Did some online research, then headed for the local Best Buy. Lots to choose from, but since I have Macs as well as PCs in my home, my choices were narrowed. Netgear had treated me well, so I picked up the WPN824 and came home to install it.The out-of-the-box experience was not what I had expected it to be. Here’s the post describing the Olympus digital camera experience. Netgear’s box was well designed and informative, but the magic stopped there. 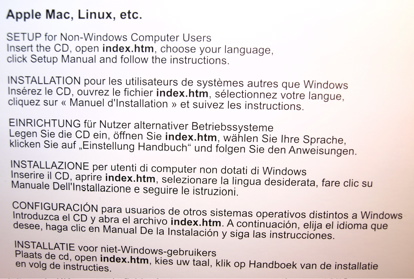 The CD had some quick start instructions that told me to insert the CD and click on the index.htm icon. But it was repeated in 7 other languages. Hate that. I reviewed the Getting Started sheet and followed the Apple Mac instructions to the letter. It promised me a Smart Wizard Configuration Assistant would be conjured up to lead me seamlessly through the process. After about 5 minutes of rubbing the lamp, and using up my 3 wishes, no one appeared to help me, and I wasn’t online. Here’s the CD sleeve. The box promised 24/7 technical support, so I reached for the phone. In short order I was speaking to a pleasant gentleman (probably in an offshore call center). He was excellent. Asking specific questions to understand what was going on, and giving me extremely good direction. I asked him why the Smart Wizard didn’t show up, and he informed me that the CD does operate on a Mac. He deflected the comment and focused on trying to solve my problem. When I threw him another curve ball he said, “That’s no problem, we can work around that.” In less than 10 minutes he had the router configured from my Mac G5 and insisted on staying with me until I had accessed the Internet with all my computers. So kudos to Netgear for having a well trained and available staff. However, I am not a nascent when it comes to technology, and fully expected to get up and running with the new router on my own. So while Netgear has done a good job training their most expensive customer service channel, they failed at helping their customers in the much less expensive self-serve channel. Most of what was provided to me in the box was either wrong, or would not work with my operating system, despite claiming compatibility on the box. They should trade in their so called Smart Wizard for one that is more effective at conjuring. By paying closer attention to their out-of-the-box experience they will can deliver a better customer experience for less money. Obviously I am back online (having averted yet another crisis) and fully expect my Netgear router to serve me for years to come, just as the last one did.